About this object James Blaine of Maine served three terms as Speaker of the House. He later served as Secretary of State under three different Presidents. 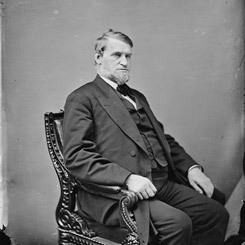 The 42nd Congress (1871–1873) began with President Ulysses S. Grant’s request for additional power to combat domestic terrorism against freedmen at the polls. Congress responded with the Third Ku Klux Klan Act and a joint committee to investigate conditions in Southern states. After a failed attempt to establish a provisional civil-service program, Congress began investigating bribes in the form of Crédit Mobilier stock given to various Members of Congress to ensure the passage of the Pacific Railroad Act. Congress also passed legislation that doubled the salaries of federal officials and Members of Congress. The New York Sun exposed the Crédit Mobilier scandal. 1Representative Fernando Wood of New York nominated the Democratic leadership slate in the House, but there is no other evidence to show he was elected caucus chairman.